Scandinavian & Nordic food is hot right now. This is due mainly to the fact that the two Michelin star restaurant Noma in Denmark has been named Restaurant of the Year for the last three years. The chef Rene Redzepi is responsible for starting the reinvention and redefinition of traditional Nordic cuisine and is leading the way in the “wildculture” and foraging revolution. No wanting to be left out ( but in no way tempted by the pickled herrings or live ants )I decided to have my own revolution. Thanks to The Washer Up’s dad, Jim, who sends me everything food related that he has cut out of English newspapers, I have a constant input of recipes from the frontline of food fashion. These caught my eye because they contain three ingredients that, for me are (or used to be) quite challenging. 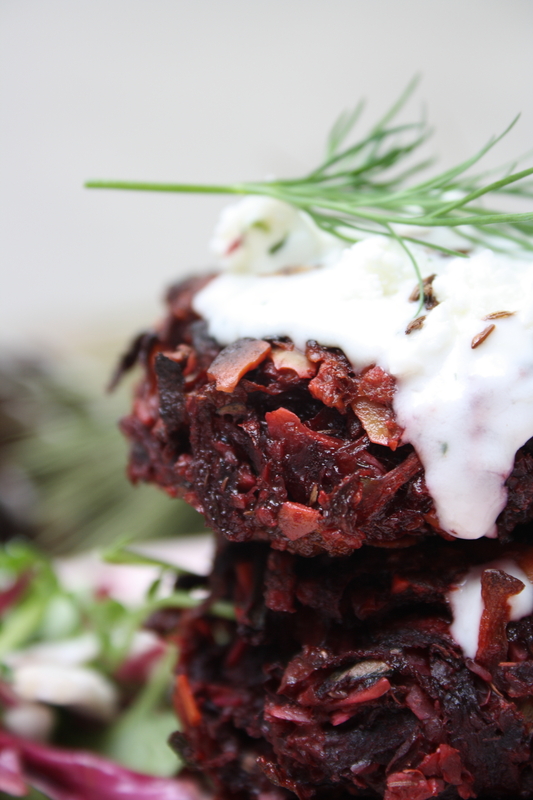 I didn’t used to like beetroot at all now I love it especially in this Beetroot Hummus. Dill used to be my least favourite herb, I never used it and avoided it wherever possible. Now, thanks to a few weeks in the summer cooking for an Iranian family who use dill in and on everything, I love that too. It’s brilliant with beetroot as in this Roasted Beetroot Salad with Dill Hazelnut Pesto. Horseradish on the other hand is a whole different can of worms. Does Rene do worms too? I hate horseradish. Can’t even go near it. At the restaurant we served horseradish sauce with the roast beef, it would make me heave just clearing it from the table. So I didn’t. You may be wondering why I have such a strong aversion to it. Well I’ll tell you why. Dad, the truth will out. When I was very young, about four year’s old I think, we went to my Nan & Grandad’s house for lunch as we did most weekends. My grandad used to grow his own horseradish and make it into horseradish sauce by grating it fresh into large jars that were stored in the larder. Now for some reason best known to his evil self, my dad decided to open one of these jars, stick it under my little four year old nose, and told me to take a big whiff of it. I screamed and cried for what felt like quite a long time. I can still feel it now, the burning nostrils, watering eyes and numb brain. And what was my dad doing? Laughing he was, thought it was hilarious. As did my grandad come to think of it. Still not forgiven him for that. Should have reported him to the NSPCC. So in the spirit of Noma and the food revolution I decided to give it a try. I decided to move on and give closure to my horseradish hatred by using it in this recipe. And do you know what, I liked it. It actually tastes really good in this dish. It’s still not my favourite thing and I held my breath while spooning it out of the jar but I can see what all the fuss is about. 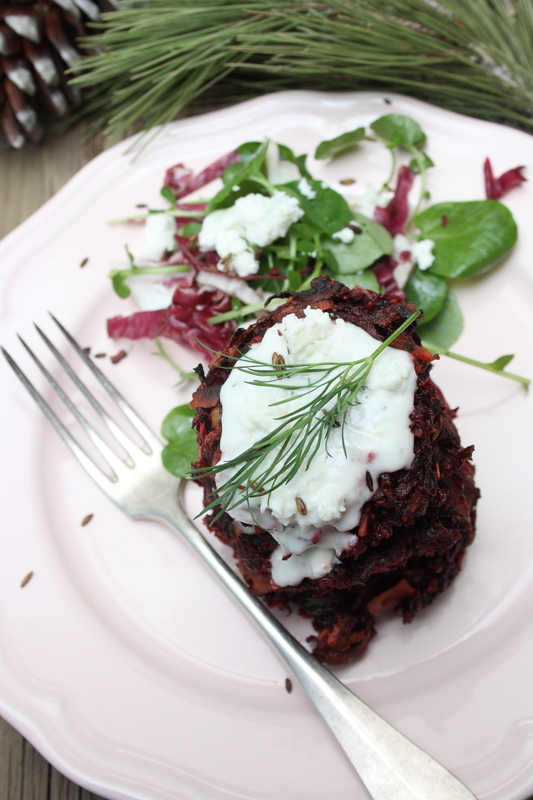 Beetroot and horseradish is a fabulous flavour combination. Just don’t go making young children sniff it. Because that would just be mean. I made about 12 fritters out of this recipe which should feed four people as a lunch or starter with a salad. You could serve it with some boiled new potatoes for a main course. You could also make smaller flatter cakes and serve them as canapés with drinks. Just top with a blob of the sauce and a sprig of dill. You should get about 24 and they will obviously not take as long to cook. 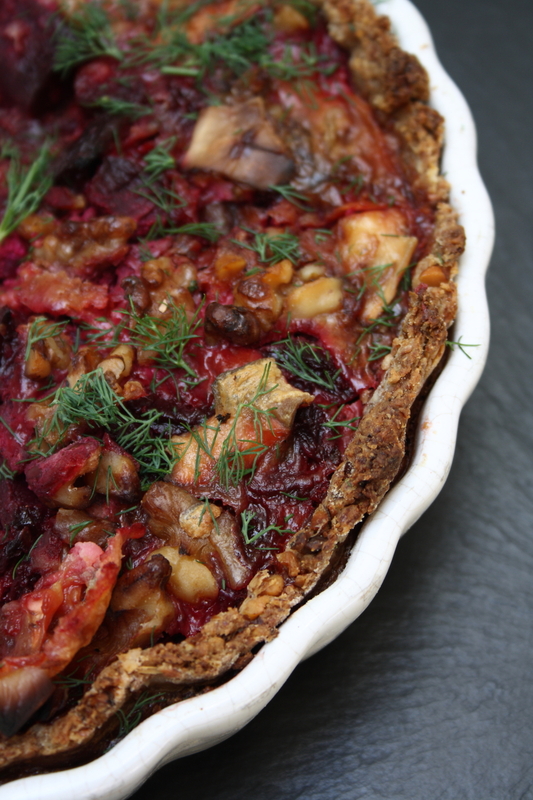 Mix together the peeled & grated beetroot & carrot with the shallot, almonds, thyme, coriander, oats, eggs, salt & black pepper in a bowl until well combined, cover and leave in the fridge for at least an hour. I left some overnight for lunch the next day and it was still good. Preheat the oven to 180C. Using gloves, take a handful of the mix and squeeze it into a fritter shape (squeezing out any liquid) and place on a plate while you make the rest. Heat 2 Tbsp oil in a frying pan until hot. Then cook the fritters over a medium high heat on both sides until crispy, about 2 minutes a side. Remove with a slotted spoon to an ovenproof dish and bake for about 25 minutes. 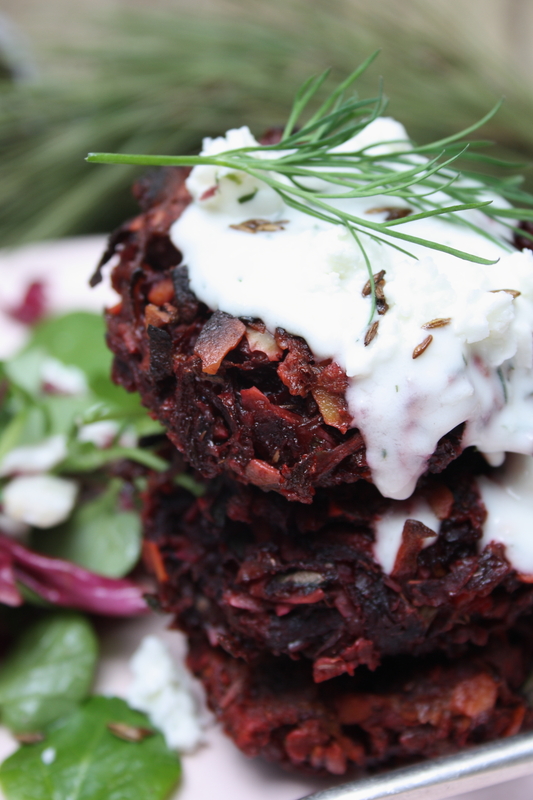 Make the sauce by mixing the yoghurt/crème fraiche with the horseradish. Start with 2 Tbsp horseradish and add more if needed, I am a horseradish wimp though. Then add the lemon, honey, dill salt & pepper and taste. Adjust as required. Toast some cumin seeds in a pan until fragrant. 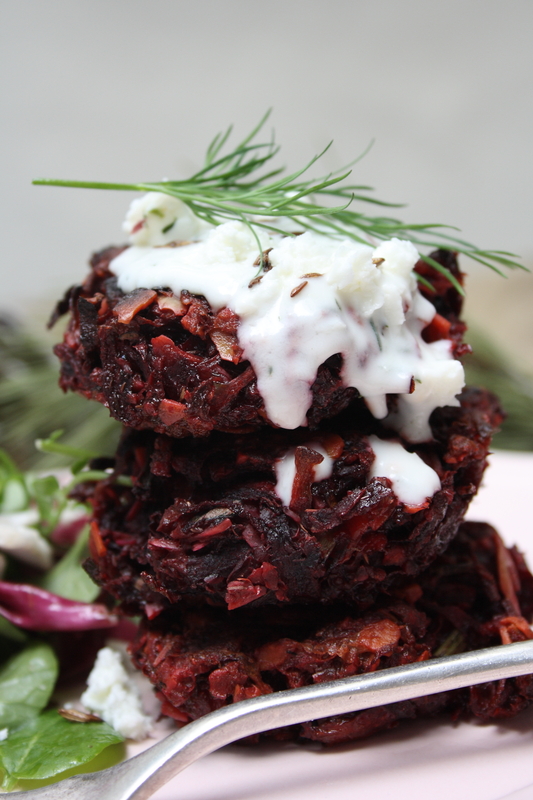 To serve: make a little tower of beetroot fritters and generously drizzle over the horseradish sauce. 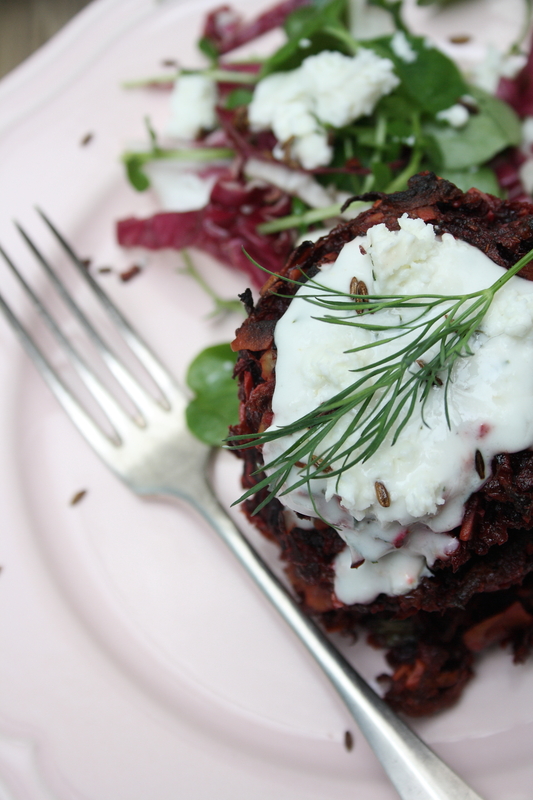 Sprinkle over some cumin seeds, some crumbled feta (if using) and top with a sprig of fresh dill. I served them with a radicchio and watercress salad with a lemon & olive oil dressing. Antonia, the lady that does the washing up at the restaurant, gave us a tub full of her homegrown cherry tomatoes yesterday. I thought about roasting them but I really did not want to put the oven on today. It’s far too hot for all that so I made my favourite summer salad instead, Ensalada de Tomate y Ajo (Tomato and garlic salad). I first had this salad in Bar Sardina, a restaurant/tapas bar in Alhaurin that has been around for 92 years, apparently. They are well-known for their fresh seafood especially the Conchas Finas which are like a cross between a scallop (they have a coral) and a clam. They are indigenous to Malaga and are traditionally served raw, with a glass of Fino (dry sherry). Being a vegetarian, it is normally quite difficult to find something to eat if you go out to typically Spanish restaurants . Fortunately Bar Sardina has three dishes that I can order, all of them being fantastic. This salad is so simple but so delicious, which is what for me, sums up Spanish cuisine. It’s all about the ingredients and letting them do what they do best. The best, in season, sweet tomatoes are mixed with lots of fresh garlic, drizzled with Andalucian extra virgin olive oil, good Jerez (sherry) vinegar and seasoned with sea salt, black pepper and some fresh parsley. That’s it. Wash the tomatoes and cut them into halves or quarters for cherry tomatoes or into wedges for normal tomatoes. Mix them with the garlic and parsley in a bowl and drizzle them generously with olive oil, then add the sherry vinegar. Leave to marinate for a while if you can and then season well with the sea salt and black pepper. Taste and adjust vinegar/seasoning. Tip into a serving dish, garnish with a little more parsley and serve as part of a meal like the Spanish do. Or you can do like I did and eat it with some of my sundried tomato & basil focaccia (or any nice bread) to soak up the gorgeous garlicky, tomatoey juices. This is the perfect simple summer salad, enjoy this right now when tomatoes are at their best. Another sure sign that Autumn is just around the corner. I’m so looking forward to the cooler weather….! This is a great alternative to all those rich mayonnaise based potato salads. It is spring on a plate. Fresh, seasonal, delicious and completely guilt free. I served it warm as a side dish with dinner and then cold for lunch the next day. Both ways were lovely. It would be great for a barbecue or buffet too. I bought some beautiful baby new potatoes from the market along with fresh asparagus & broad beans. This formed the base of my salad now I just needed a dressing. My mint plant on the roof terrace is growing like mad with all the rain so I had to use it. A basil pesto would work really well too but I think the mint with the new potatoes is heavenly. The hazelnuts add a slight sweetness which rounds off the flavours and brings it all together. Put the potatoes and mint stalks in a large pan of cold, salted water, bring to the boil & cook until just tender. Add the asparagus & broad beans to the potatoes and cook for another 3 minutes. Drain in a colander and remove the mint stalks. Meanwhile make the pesto. Process the hazelnuts, mint, olive oil, garlic, lemon juice, salt & pepper to a paste. Taste and add more salt if necessary. If you need to add more liquid use olive oil, lemon juice or a bit of veg stock. If you like you can peel the broad beans at this point if the skins are tough and you want a brighter green colour. Tip the potatoes, beans, asparagus and spring onions into a bowl, pour over the pesto and mix everything together well. Check seasoning again. Serve straight away sprinkled with some chopped hazelnuts and mint leaves or store, covered in the fridge until about 10 minutes before you want to serve it. Let it come to room temperature then garnish as above. This is a really elegant, flavourful side dish that can be adapted to what is in season or what you have in the fridge. Green beans would be nice if you don’t have asparagus and try swapping the mint/hazelnut for parsley/almond pesto. It has just occurred to me that this is the perfect dish to take to a Royal Wedding party tomorrow. Everyone seems to be watching it on TV at someone’s house and taking something for the buffet. I must be the only person who won’t be watching it. It’s The Washer Up’s only day off so we are going out and getting our hair cut instead…. It’s not like I won’t see the dress or anything. I’m sure there’ll be nothing else on the TV for days……..
Good Luck Kate, you’re going to need it! !